Imagine walking into a conference room in the middle of a talk, and everyone in the audience is looking in different directions; some are looking up towards the ceiling, down towards their feet, turned towards the back of the room, heck—a few are even stood up facing the wall. It was complete chaos, but it was the best thing we could have observed in doing the first-ever structural biology talk conducted in mobile virtual reality. So, let’s take second to mark this as a moment in history. 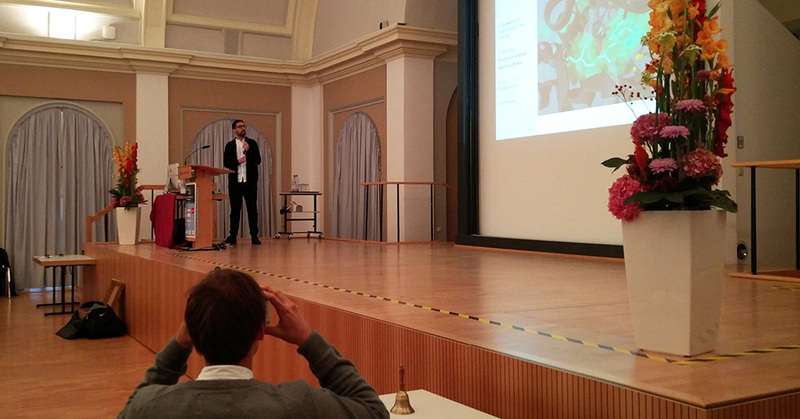 On October 5th, 2017, I attended the EMBO ICRP conference at University of Potsdam as part of an invited talk session with Ernst Lab at University of Toronto (presenting are Ph.D. student Aidin Balo and Professor Oliver Ernst) on using the Autodesk Molecule Viewer to curate and present 'Exploring the Retinal Protein World in Virtual Reality’. In a conference room of 100 retinal protein-related researchers, each audience member is immersed in a molecular world of their own, experiencing in virtual reality the structural environments curated by the presenter, Aidin Balo, on how components of a protein structure change when light reaches a photoreceptor in the retina of the eye. As Aidin talks about these changes, he guides the audience sequentially through a set of curated camera and model states customized to showcase particular molecular points of interest. The audience is free to observe these sites of interest from a variety of perspectives in virtual reality. The content of the talk was authored and conducted fully inside Molecule Viewer through a URL accessed in a web browser, and projected at the front of the room. At the same time, the audience went to the same URL on their smartphones browsers and followed along in virtual reality with their smartphones in Cardboard VR devices. For folks who didn’t have access to a smartphone, the lecture content conducted in a 3D environment was a treat. It’s important to note what we did here is not for entertainment value. 3D molecular structures are extremely organic, dense, and complex. The power of immersion in virtual reality provides novel perspectives in exploring this data and unique insights on spatial relativity between key landmarks. Molecule Viewer brings these immersive experiences to the hands of users for just a few dollars using just their smartphones and Cardboard devices. The progression of molecular visualization from 2D to 3D in the 90’s was revolutionary and expedited research, education, and outreach in a wide range of disciplines. Just like how virtual reality has recently revolutionized the gaming and entertainment industries, our question is: To what extent can it do the same for structural biology in the way people observe, explore, and interact with molecular data? By providing direct workflows to create these experiences within seconds in Molecule Viewer, our BioNano group wants to find out. If you are interested in taking a look at the content of our ICRP talk, please go to: autode.sk/icrp2016 using Chrome on your Android smartphone, or Safari on iPhone. Let the link fully load, click on the upper left menu, and ‘Start’ virtual reality. Tap the screen once to move onto the next snapshot using the thumbhole at the bottom of the Cardboard device. Rotate your head to maneuver in the environment around a central molecular site of interest defined by the presenter. Next up, check us out in November when we present the next VR talk at the iHuman forum and Molecular Architecture of Life meetings in Shanghai! Create your own Molecular Virtual Reality Experience in 60 Seconds!